Descubre el precioso interior de Katherine Gorge durante un pintoresco e informativo crucero en barco por el Parque Nacional de Nitmiluk. Elija entre un crucero de 2 o 4 horas que lo lleve a lo profundo de la red de vías fluviales que fluyen a través de Katharine Gorge, que consta de 13 gargantas separadas. Paseos cortos entre las gargantas le permiten ver más del paisaje. Escuche de su guía informativa sobre la vida silvestre y los aborígenes de esta tierra, los Jawoyn. Elija la excursión al amanecer para ver el desfiladero con la primera luz, una experiencia excepcional. Obtenga excelentes fotografías de las paredes de arenisca y el agua, especialmente en la suave luz del amanecer. Aprende sobre los guardianes aborígenes de esta tierra. 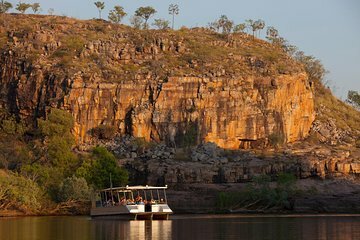 A must see attraction and we did the dawn tour and it was spectacular watching the sun come over the gorge. Well worth the drive from Darwin to do the tour. Our tour guide was both knowledgeable and fun. He adapted the trip to the opportunity to go into three gorges. We learned a great deal. Before booking this trip, it would be a good idea to ask how many gorges are accessible. We were traveling at the end of the wet season so had more access. A great experience. Our guide was fantastic. The gorge was amazing. All sorts of wildlife from bats to crocks. We would say do it. Thanks guys. the weather was lovely dry season and our tour guide was wonderful with lots of information of the area and stories. it was wonderful, deifnatly worth the 3 hour trip from darwin. Excellent trip. Great value for money. Very informative and spent a few hours doing walks in the park after the cruise. Loved it. Fantastic tour spectacular views and scenery, a recommended tour .